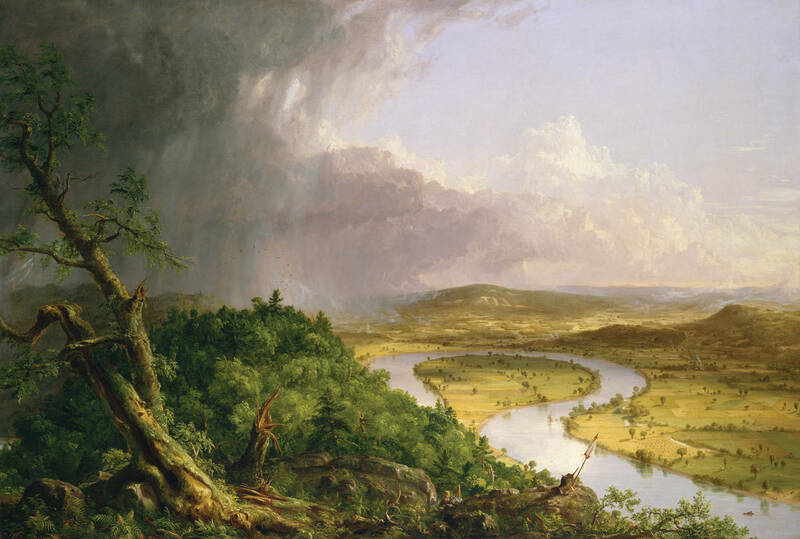 You can see this large painting by Thomas Cole at the Metropolitan Museum of Art. Below is a detail image of the artwork above. The figure painting in plein air is thought to be a self-portrait of the artist. 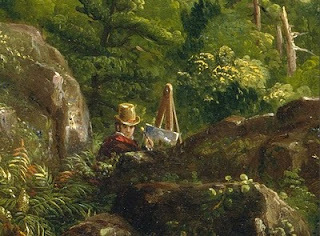 On the Explore Thomas Cole website, there's an interactive tour that interprets the meaning behind his work and includes sketches and studies that shed light on the artist's process. View from Mount Holyoke gives me a feeling of how things really were in that time period. The artist perched and painting a landscape that is lush and cleaned by the passing storm. Look at what he's wearing! Can you even imagine? I bet his horse and cart were waiting nearby. The landscape lets you feel what it must have been like to live in a time where people didn't think as much about pollution in nature. The colors are amazing. The Hudson River school which Cole was the founder believed in the magnificence of nature and the freshness of the American landscape. From the pairings by season or time of day to the"voyage of life" affected 3 generations of Hudson River artists to the same theme...the greatness of nature. One of my favorite paintings is "kindred spirits by Asher Durand a eulogy to Thomas Cole " to these haunts we kindred spirits flee"
Thank you so much for your thoughtful comments! Anon- I love how that painting really puts you into that time. Robert- The Voyage of Life series and the Kindred Spirits paintings are so fascinating!